When the Self Emerges: Is That Me in the Mirror? To this day the ‘mirror test’ remains the best experiment yet developed for examining the emergence of self-concept in infants. Most people look out for number one, themselves, which makes it strange to think that there was ever a time when we had no concept of ‘me’. A simple study dating from the early 70s suggests that before the age of around two years old we can’t recognise ourselves in the mirror. Because of this study, and the many variations that have followed, some claim that it isn’t until our second birthday that our self-concept emerges. In 1972 Beulah Amsterdam from the University of North Carolina published a study that has kicked-off decades of research on self-recognition (Amsterdam, 1972). The study’s procedure was simple. Infants between the ages of 6 and 24 months were placed in front of a mirror after a spot of rouge had been surreptitiously put on their noses. Then their mothers pointed to the reflection in the mirror and asked the child: “Who’s that?”. Researchers than watched infants’ behaviour. 6-12 months: it’s another baby! 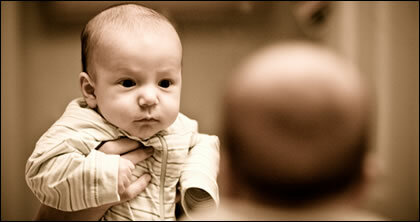 The child behaves as though the infant in the mirror is someone else – someone they’d like to be friendly with. They display approach behaviours such as smiling and making noises. 13-24 months: withdrawal. The infants no longer seem particularly happy at catching their own image in the mirror. Some look a little wary while others will smile occasionally and make some noises. One interpretation of this behaviour is that the infants are acting self-consciously here (perhaps demonstrating self-concept), but it could also be a reaction to another child. 20-24 months onwards: it’s me! From around this age infants start to clearly recognise themselves by pointing to the spot of rouge on their own noses. This strongly suggest they have realised the image is themselves and the spot of rouge is on their own nose. Although Amsterdam’s results were from a small sample size, they have subsequently been repeated with many more participants. Also, later studies with control conditions have found infants in this age-range don’t touch their nose if it isn’t marked with rouge. This showed that touching the nose isn’t somehow a natural reaction for infants to seeing own reflection. Of course this study simplifies a mass of psychological complexity. Psychologists have raised all sorts of questions about what the mirror test reveals. It could be, for example, that infants just don’t understand faces particularly well until they are around two years old. Perhaps, then, they develop a self-concept at a much earlier stage. Alternatively it could be that at around two years old infants develop a solid physical or visual self-concept, but still have little mental self-concept. In this case all the test is showing is that we know what we look like; perhaps we don’t develop our self-concept until much later in life. Results are especially ambiguous because only limited tests can be carried out on children.These are just two common explanations, I’m sure you can think of more alternatives. This multitude of possibilities illustrates one of the major hurdles in child psychology: results are especially ambiguous because only limited tests can be carried out on children. Still, despite these alternatives, the mirror test has proved remarkably hardy over the years and is still used today while other tests have fallen by the wayside. One of the reasons for its resilience is that it seems likely that self-concept might well emerge at this age from all the other things we know about children. It is from around 2 to 4 years of age that children start to display a rapid increase in their social behaviour. Being able to distinguish yourself from other people is fundamental to successful social relationships rather than simple interactions. It seems unlikely that infants would be able to build relationships with others without some limited concept of themselves. Being able to distinguish yourself from other people is fundamental to successful social relationships.The mirror test has also been used on other animals to test their self-concept, indeed the test was originally carried out on chimpanzees by Professor Gordon Gallup a few years before Amsterdam. All the great apes ‘pass’ the test, along with dolphins, whales and elephants. In one recent study an 8ft mirror was placed in the elephant enclosure at New York’s Bronx Zoo and the elephants had marks painted on their heads. Researchers who kept watch on the elephants’ reactions saw them touch the paint marks on their own heads. It’s no coincidence that elephants, like the other animals that pass the test, have complex social systems. Basic self-recognition is key to being able to relate to others; with this knowledge infants take their first faltering steps into the social world. » This is part of a series on 10 crucial child psychology studies. Read more on the emergence of infant memory, learning, attachment, social behaviour, theory of mind, object permanence, language, play and knowledge. Amsterdam, B. (1972). Mirror image reactions before age two. Developmental Psychobiology, 5, 297-305.